Scientists at the University of Buffalo have developed a new type of optical device that can detect several types of drugs, harmful chemicals, and explosives. The technique, of throwing light on the material being analyzed to detect its composition is known as Spectroscopy. Scientists use this method to detect traces of chemicals by shining infrared light and then study how it interacts with the material. Infrared absorption spectroscopy is in existence for several decades now and has seen improvements over a period of time. It's most commonly used in anti-doping tests where scientists figure out whether the athlete's blood sample contains performance-enhancing drugs. It can also be used to detect the presence of minute particles of explosives in the air. Several attempts have been made to make the technology more sensitive and affordable. The team of scientists at the University of Buffalo made an advancement in the direction by developing a new optical device that makes a mark in both the areas. The study was published in Advanced Optical Materials. 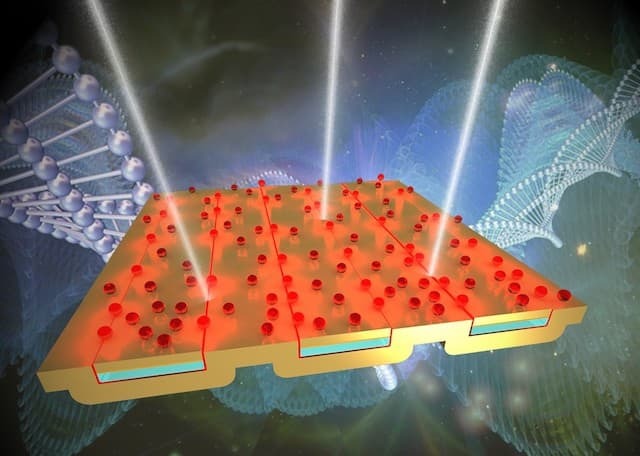 Lead author of the research, Prof. Qiaoqiang Gan, Ph.D., associate professor of electrical engineering said that the new optical device is capable of detecting all types of biological and chemicals samples. It makes use of light in the mid-IR band of electromagnetic spectrum. It's the part of the spectrum that's used by remote-controls, night-vision, and other similar appliances. The sensor is made up of two metallic layers that sandwich an insulator. Using atomic layer deposition, which is a fabrication technique, the team created a device with gap several thousand times smaller than a strand of human hair. This gap can absorb 81% of the IR light. The team said that this is a huge improvement over the similar devices that can only absorb about 3% of IR light. Above technique is known as SEIRA, aka surface-enhanced infrared absorption. The new sensor improves the sensitivity of SEIRA to detect molecules by a factor of 100 to 1000. The team says that the sensor can be deployed to detect the presence of drugs in the blood stream, chemicals that are often used in making bombs and even in tracking diseases. The team wants to continue improving their sensors. More information about the research is available on the official source link below.